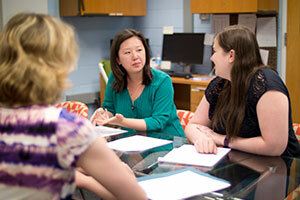 Open advising hours held by psychology faculty are posted in the reception area of clinical and social sciences in psychology, on the third floor of Meliora Hall. Advisors are not assigned. Students can pick an advisor from the list below. Students can change advisors as needed to fit their curriculum and scheduling needs. Students can stop by anytime during the faculty advising hours, no appointment needed. The Department of Clinical and Social Science in Psychology's Committee on Undergraduate Studies in Psychology (CUSP) administers the major, honors program, minors, and clusters in psychology. Support for CUSP is provided by our academic coordinator, Melissa Rusnica (melissa.rusnica@rochester.edu), whose office is located in Meliora Hall, room 441. To declare your major officially, you will have to meet with an advisor and have him or her sign off on your major declaration form. The list of advisors and their hours can be found above. To major in psychology you will need to complete all of the requirements outlined on the major requirements page. If you’ve already declared your major, but would like to change it, you can do so at any time by having any faculty advisor sign off on a revised declaration form (the blue form) and submit it to Lattimore 312. Transfer of AP credit can be accomplished via Lattimore 312 and not through the psychology department. If you received a 4 or 5 in AP psychology, then you will receive a four-credit equivalent for PSY 101 and won’t have to take it again. You can transfer up to four classes (PSY 101, a statistics class, plus two others) from another university or college. If you want to substitute a class for Introduction to Psychology or an elective not offered by the University of Rochester, you can see any faculty advisor with a copy of the full syllabus and have them sign off on the course approval form. If you want to use a transfer class to substitute for a class that is currently being offered at the University of Rochester, you will need a copy of the full syllabus. Take it to the professor who teaches the equivalent class at Rochester and have them review and sign off on the course approval form. It is important to obtain this written statement from the person who teaches the equivalent course at the University of Rochester attesting to its equivalency before meeting with an advisor in psychology. Students who are double majoring can have up to three courses overlap between majors. For students double majoring in brain and cognitive science (BCS) and psychology, we suggest using PSY/STT 212, BCS/PSY 110 and BCS/PSY 111. Students can also have up to two classes overlap between two minors or a major and a minor. See the College Overlap Policy for more information. Students who would like to substitute a non-psychology class must submit an appeal in writing and stop by and give it to an advisor during his/her advising hour. The advisor will take it to the committee and return with a verdict on whether or not the class is viable. Please note that approvals are rarely made. If you want to propose your own major involving psychology, you will need to seek out two faculty members (one from psychology and one from the other field you’re looking to study). For each advisor, have an outlined list of classes you’d like to take and why, and be prepared to discuss the rationale for your selection with your advisor. If your faculty advisors agree with your plan, they will sign off on the form to be submitted to the department of inter-departmental studies. The inter-departmental studies program will have the final say as to whether the proposed program is valid or not. For more information on creating your own major, see the interdepartmental studies page. When studying aboard, it is important to make sure that your courses are going to transfer before you go abroad. If you participate in an accredited study abroad program, your credits will transfer as electives. If you want to transfer classes to be used in place of ones currently being offered by the University, please follow the same guidelines outlined above in “Class Substitutions”. For more information about going abroad, see our study abroad page. Working as a research assistant in a faculty member’s lab—Responsibilities include running experiments, data entry/management, coding, literature reviews. You must meet with the faculty member to outline responsibilities, hours, and credits. See our list of open RA positions to get started. Doing an independent study—A more flexible option that can take various forms such as readings, research, specialized class, internship, etc. Must meet with a faculty member to outline responsibilities, hours, and credits. Teaching/TAing with a faculty member for a class—Assist a faculty member in conducting his/her class. Responsibilities can range from leading your own lectures, grading, office hours, proctoring exams, grade entry, etc. Must meet with the faculty member to outline responsibilities, hours, and credits. Honors project—Conduct your own proposed research project under the supervision of a faculty member. See the honors page for more information.